Haven’t decided on a hotel yet? You can look at other available hotels in the regions of Campania and Apulia with Booking.com. If you are interested in staying in a villa in Campania, Booking.com offers a number of stunning properties. One of the most utterly magical regions of Italy, Campania boasts of magnificent ancient ruins, one of the most famous coastline roads in the world, and islands that shimmer in the Mediterranean sun. From the sirens of ancient Greek myth, to the press of 21st-century crowds, visitors can’t help but succumb to the madness of Naples and to the scent of the orange blossoms of Ravello. Apulia (Puglia) is often overlooked by foreign tourists for Italy’s more glamorous regions, but not so by the British and the Italians, who pour into the area for its fine beaches, historical and artistic sites, and vistas of orchards, wine-twisted pines, junipers, and silvery olive trees. Just about every conquering army in a European history book has raided or colonized Apulia—Greeks, Romans, Byzantines, Saracens, Normans, Swabians, Turks, and Spaniards—leaving a fascinating architectural record of mighty castles, Romanesque churches, and labyrinthine casbahs—all worthy of a visit. Apulia produces 80% of Italy’s pasta and olive oil; most of Italy’s fish comes from the Adriatic, and its fields provide a garden of fresh produce. Welcome to a world of incredible cuisine! Amalfi Coast Reminiscent of California’s Route 1, this 69-km (43-mile) coastline road is known for its sheer beauty and sheer drop off into the sea. It’s a white-knuckle drive not to be missed: Villas sit airily atop precarious cliffs; hairpin turns reveal vistas so gorgeous you’ll burst into tears. Cars and crowds aside, peaceful bliss can be found in the enchanting towns of Ravello, Amalfi, and Positano. Pompeii and Herculaneum What school kid has not read the classic story of Mt. Vesuvius erupting in 79 AD, burying these Roman towns in volcanic ash and mud and freezing insights into their way of life for posterity? Mt. Vesuvius is still very much an active volcano and well worth a visit. Isles of Capri, Ischia, and Procida In Capri, narrow alleyways, intimate piazzas, white houses, and the famed Blue Grotto attract boatloads of day trippers. Although Ischia brings in the package tourist crowd, you can find corners of solitude. Procida is the most peaceful of the islands and is the locale of the movie Il Postino. Paestum This ancient Greek colony dates back to the 6th century and is one of Italy’s finest archaeological sites, as well as a UNESCO World Heritage Site. The three golden stone Doric temples are the best preserved in Europe. Naples Everyone has a strong opinion of this crazy, somewhat out-of-control city. Give it a chance and come visit (but leave your purse in your room). Worth a look is the National Archaeological Museum (Museo Archeologico Nazionale) filled with mosaics and sculpture excavated at Pompeii and Herculaneum; the National Museum and Gallery of the Capodimonte(Museo e Gallerie Nazionale di Capodimonte) hosts the Farnese collection of Italian masters. Naples is home to a number of fine castles, including the 12th-century, Norman-built Castel dell’Ovo and the 13th-century, moated Castel Nuovo. Gargano Promontory (Promontorio del Gargano)In contrast to the Adriatic’s somewhat flat coastline, this mountainous promontory features white limestone cliffs, pristine beaches, and some of Italy’s few remaining ancient forests. The peninsula is also the home of Monte Sant’Angelo, an ancient pilgrimage site visited by St. Francis of Assisi and crusaders en route to the Holy Land. 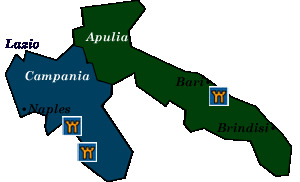 Castles of Apulia With a coastline vulnerable to invading forces, everything worth protecting needed fortification. This region is covered in castles, most notably those built by Frederick II of Swabia (Frederick I of Sicily). Some of the most impressive are Castel del Monte, which is a UNESCO World Heritage Site, the castle at Lucera, and Frederick’s son’s castle at Manfredonia. Grotte di Castellana This amazing network of limestone caves with its fantastically shaped stalagmites and stalactites is Italy’s largest. Alberobello and the trulli district With unknown origins in the Middle Ages, trulli are strange, white-washed, conical structures with domed roofs and painted symbols. Over a 1000 of them are clustered around Alberobello, a UNESCO World Heritage Site.